When a Hollywood agent tries to keep her major client, a leading man, from “lapsing” into homosexuality, it makes for some great laughs in Douglas Carter Beane’s comedy about a cut-throat business and those who know how to play it. Nominated for a Tony in 2007, if anything, “The Little Dog Laughed” may have lost some its luster in the ensuing years just because of an ever increasing liberal slant on stars and their sexual preferences. The example that comes immediately to mind is Matthew Bomer from “White Collar” and “Magic Mike.” Despite coming out last year, ask any girl and the mere mention of his name still sends them into a romantic swoon. But, although the stigma isn’t as crushing as it once was, the play still has relevance and it’s loaded with plenty of laughs and a plausible outcome that may feel like a cop out to some. In the Stray Dog production, Sarajane Alverson is nothing short of brilliant as the vicious, conniving agent, Diane, who will go to any length to get a hot property for her client and then try to keep his peccadillo’s from sinking the chances for the play to become a box office hit for that client, Mitchell Green. From her opening monologue to the confrontations between Mitchell, his new lover and even an imaginary playwright, she oozes a tenacity worthy of a bulldog holding onto a bone. Bradley J. Behrmann plays Mitchell as a man who appears to think more of his libido than his career. In a day, not long ago, when every matinee idol had a reputation to uphold off the screen as well as on, any hint of “deviant” behavior would not be allowed. It was an art form back in early Hollywood when the studios even arranged marriages like that of Charles Laughton and Elsa Lanchester to keep up appearances of propriety while the stars pursued their other interests on the side and away from the public. But Behrmann’s Mitchell doesn’t seem to be concerned with propriety, just with trying to decide whether or not his feelings are just a passing fancy or the real thing. It’s a strong performance because of his honesty with himself. In the meantime, he has “ordered up” a gentleman to join him for the evening in his hotel room while in New York and the service sends over Alex (calling himself Bryan- with a “y” to mask his real identity). Paul Cereghino’s Alex has issues of his own as he is hustling to make money but really has a girlfriend which brings up even more complications later on when both men decide they like each other despite not even consummating the deal that first evening. Cereghino’s charm and apparent struggles with his character’s feelings make for a very honest and believable performance. Director Gary F. Bell has pulled out all the stops in this production bringing every laugh and every underlying theme out in the open. Both souls and bodies are laid bare (which makes it a very adult comedy) as we explore “what price fame?” along with a duffel bag full of other emotions criss-crossing the stage. Rob Lippert’s clever set design creatively takes care of the multiple locales of the play with the focus on the always existent double bed up center. 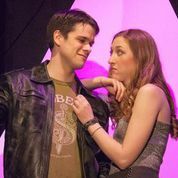 Tyler Duenow’s lights also help establish the various settings while Gary F. Bell’s costumes offer a wide range of highly appropriate choices for the ladies while sticking with the basics for the men. This is a very funny play and this talented cast pulls things off beautifully. They manage to create solid emotional moments as well as the hilarious banter that is at the heart of “The Little Dog Laughed.” Despite the obvious flaws of an ever-changing social landscape that I mentioned at the outset, the audience can easily look at this as a “period” piece (even if that period is 2007). But I don’t think anyone will have trouble picking up the rhythm and flow of this wonderful script and the marvelous cast as they bounce along with that rhythm on waves of laughter. “The Little Dog Laughed” plays at Stray Dog Theatre through February 22nd. Give them a call at 314-865-1995 or contact them at straydogtheatre.org for tickets or more information. This entry was posted on February 7, 2014 at 9:43 pm02 and is filed under Uncategorized. You can follow any responses to this entry through the RSS 2.0 feed. You can leave a response, or trackback from your own site.